BREVARD COUNTY • TITUSVILLE, FLORIDA – The Titusville Police Department took home three first place trophies at the 14th Annual Central Florida Law Enforcement Car Show on Saturday. This event, held at the Oviedo Mall each year, helps raise funds for youth programs and features over a hundred entries in a variety of categories. 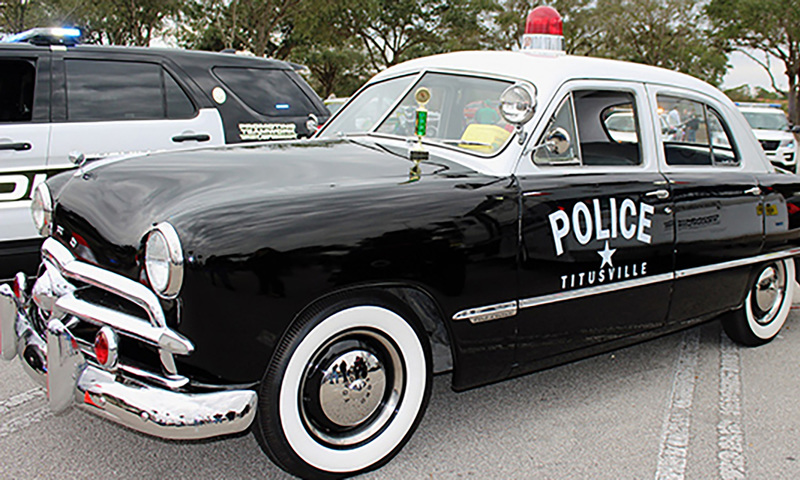 Titusville’s award winning 1949 Ford police sedan, purchased and restored using forfeiture funds, received First Place for “Classic Car”. Titusville’s 2018 Chevrolet Traverse received First Place for “Unmarked Car” with the judges praising the 360-degree emergency lighting, while remaining undetectable when the emergency lights are off. And for the second year in a row, Titusville Code Enforcement was awarded First Place for “Code Enforcement” vehicle. “It’s great for our department to be recognized,” said Titusville’s Deputy Chief Todd Hutchinson. Sponsors of the event include Cops N’ Cars for Kids, and the Optimist Club of Oviedo and Winter Springs.